It’s been 5 years since the God of Cricket, Sachin Tendulkar retired from the game. He played his last international game at his home ground – Wankhede Stadium, Mumbai. November 16, 2013, was the day he last appeared on a cricket field in Indian colors. 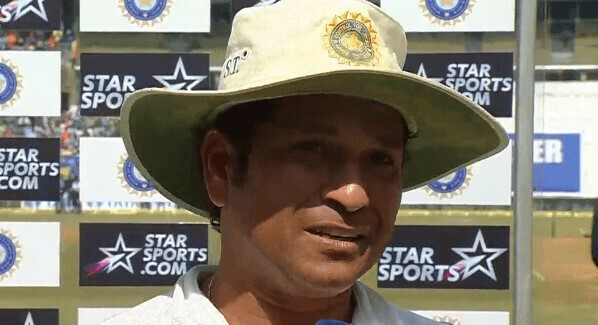 The Sachin Tendulkar retirement speech is something every young and aspiring cricketer should listen to. Here we present the full speech of the legendary Indian cricketer. All my friends. Settle down let me talk, I will get more and more emotional. My life, between 22 yards for 24 years, it is hard to believe that that wonderful journey has come to an end, but I would like to take this opportunity to thank people who have played an important role in my life. Also, for the first time in my life, I am carrying this list, to remember all the names in case I forget someone. I hope you understand. It’s getting a little bit difficult to talk but I will manage. The most important person in my life and I have missed him a lot since 1999 when he passed away, my father. Without his guidance, I don’t think I would have been standing here in front of you. He gave me freedom at the age of 11 and told me that [I should] chase my dreams, but make sure you do not find shortcuts. The path might be difficult but don’t give up, and I have simply followed his instructions. Above all, he told me to be a nice human being, which I will continue to do and try my best. Every time I have done something special [and] showed my bat, it was [for] my father. My mother, I don’t know how she dealt with such a naughty child like me. I was not easy to manage. She must be extremely patient. For a mother, the most important thing is that her child remains safe and healthy and fit. That was what she was most bothered and worried about. She took care of me for the last 24 years that I have played for India, but even before that, she started praying for me the day I started playing cricket. She just prayed and prayed and I think her prayers and blessings have given me the strength to go out and perform, so a big thank you to my mother for all the sacrifices. My eldest brother, Nitin, and his family have always encouraged me. My eldest brother doesn’t like to talk much, but the one thing he always told me is that whatever you do, I know you will always give it 100% and that I have full faith and confidence in you. His encouragement meant a lot to me. My sister, Savita, and her family was no different. The first cricket bat of my life was presented to me by my sister. It was a Kashmir willow bat. But that is where the journey began. She is one of those many who still continues to fast when I bat, so thank you very much. Without that, I don’t think I would have been able to play cricket freely and without stress. Thanks for bearing with all my fuss and all my frustrations, and all sorts of rubbish that I have spoken. Thanks for bearing with me and always staying by my side through all the ups and downs. You are the best partnership I’ve had in my life. Then, the two precious diamonds of my life, Sara and Arjun. They have already grown up. My daughter is 16, my son is 14. Time has flown by. I wanted to spend so much time with them on special occasions like their birthdays, their annual days, their sports day, going on holidays, whatever. I have missed out on all those things. Thanks for your understanding. Both of you have been so, so special to me you cannot imagine. I promise you [that] for 14 and 16 years I have not spent enough time with both of you, but the next 16 years or even beyond that, everything is for you. In the last 24 years that I have played for India I have made new friends, and before that, I have had friends from my childhood. They have all had a terrific contribution. As and when I have called them to come and bowl to me at the nets, they have left their work aside to come and help me. Be it joining me on holidays and having discussions with me on cricket, or how I was a little stressed and wanting to find a solution so I can perform better. All those moments my friends were with me. Even for when I was injured, I would wake up in the morning because I couldn’t sleep and thought that my career was over because of injuries, that is when my friends have woken up at 3 o’clock in the morning to drive with me and make me believe that my career was not over. Life would be incomplete without all those friends. Thanks for being there for me. On a lighter note, in the last 29 years, sir has never ever said ‘well played’ to me because he thought I would get complacent and I would stop working hard. Maybe he can push his luck and wish me now, well done on my career because there are no more matches, sir, in my life. I will be witnessing cricket, and cricket will always stay in my heart, but you have had an immense contribution in my life, so thank you very much. The journey has been special, the last 24 years, I have played with many senior cricketers, and even before that there were many senior cricketers with whom I watched on television. They inspired me to play cricket and to play in the right way. Thanks to all those senior cricketers, and unfortunately I have not been able to play with them, but I have high regards for all their achievements and all their contributions. We see it on the mega-screen, Rahul, Laxman, Sourav, and Anil, who is not here, and my team-mates right here in front of me. You are like my family away from home. I have had some wonderful times with you. It is going to be difficult to not be part of the dressing room, sharing those special moments. All the coaches for their guidance, it has been special for me. I know when MS Dhoni presented me the 200th Test match cap on Day One morning. I had a brief message for the team. I would like to repeat that. I just feel that all of us are so, so fortunate and proud to be part of the Indian cricket team and serving the nation. My dear friend, late Mark Mascarenhas, my first manager. We, unfortunately, lost him in a car accident in 2001, but he was such a well-wisher of cricket, my cricket, and especially Indian cricket. He was so passionate. He understood what it takes to represent a nation and gave me all the space to go out and express myself, and never pressurized me to do this ad or promotion or whatever the sponsors demanded. He took care of that and today I miss him, so thank you, Mark, for all your contribution. My current management team, WSG, for repeating what Mark has done because when I signed the contract I exactly told them what I want from them, and what it requires to represent me. They have done that and respected that. I know my speech is getting a bit too long, but this is the last thing I want to say. I want to thank all the people here who have flown in from various parts of the world and have supported me endlessly, whether I scored a 0 or a 100-plus. Your support was so dear to me and meant a lot to me. Whatever you have done for me.